This is a very rare Triumphator P Duplex or PP. Obviously, what makes this machine stand out is the fact that it is a double or geodetic machine. 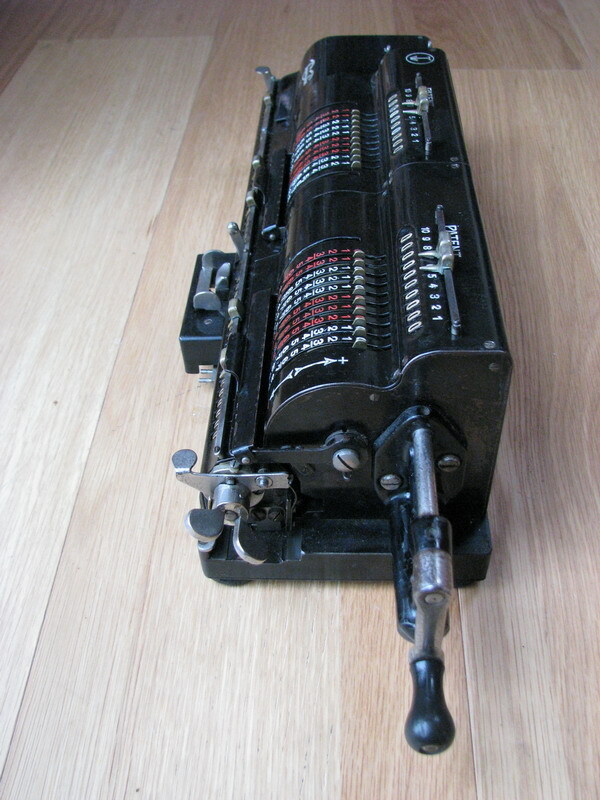 It is based on the same principle as the Odhner double machines - the carriage contains the revolution counter (which has full tens' carry) and the left and right register each belong to their own machine and cannot be shifted under the other one. This makes it largely similar in operation to a Brunsviga D13R1. Judging by the number of machines remaining today, it was not a huge selling success. Brunsviga, Odhner and Thales came out with their geodetic machines around the same time, and they had much fancier features, which apparently made them more popular and depressed sales for the Triumphator PP's. It came to the point that when you needed a geodetic calculator, you bought a Brunsviga, which is why they are about five to ten times less expensive on the market today than any other geodetic calculator. Nevertheless, this is nice and chunky well-built quality machine. It has a manual setting lever for the revolution counter (mult/div) and another, larger lever for making the left machine rotate in the opposite direction than the right one. The bit sticking out next to the factory picture on the back is to accommodate a large gear for this switching mechanism. 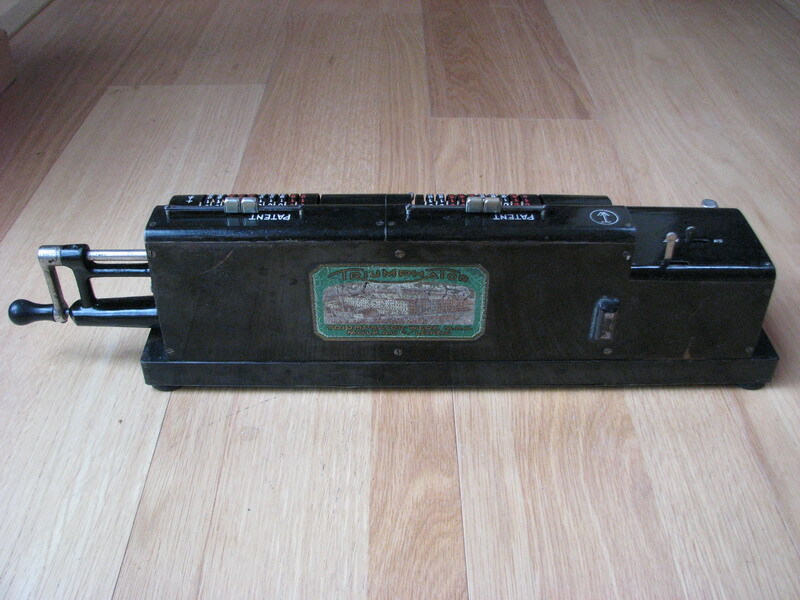 The clearing is the normal Triumphator way - lever on the right side of the carriage down for clearing the right result register, and up for clearing also the revolution counter. The lever on the revolution counter up for clearing both result and revolution counters, and down for revolution counter only. 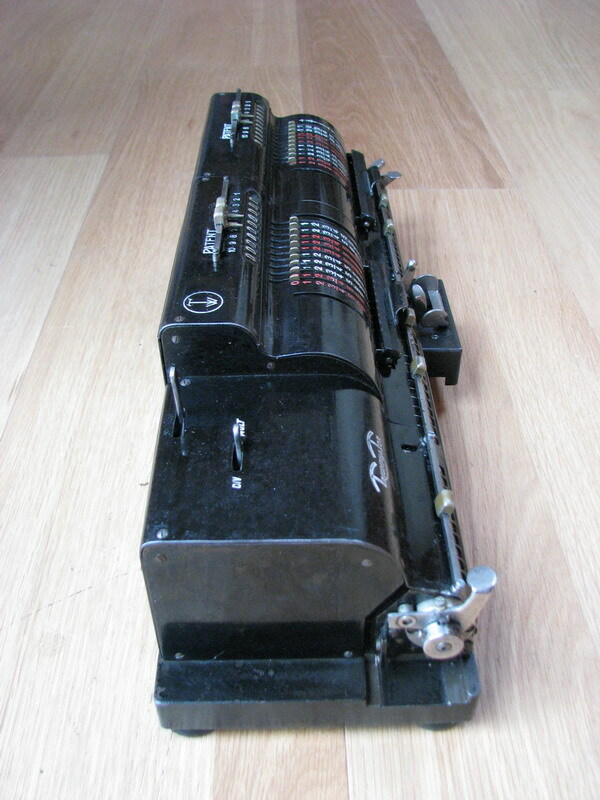 There is a small lever sticking up in the middle of the carriage as well which sets up the left result register for clearing when pressed down. All clearing is done by giving the chunky wingnut on the right a complete turn. The machine was acquired twenty years ago at a meeting by the previous owner - we have no idea where it originally came from. For pictures of the Triumphator Werk at Sommerfelder Strasse 120 in Mölkau, Leipzig, click the link. An aerial view from the other side is here. About one third of the factory was bombed and burned down during world war II, and calculator production was halted until the 1950s. 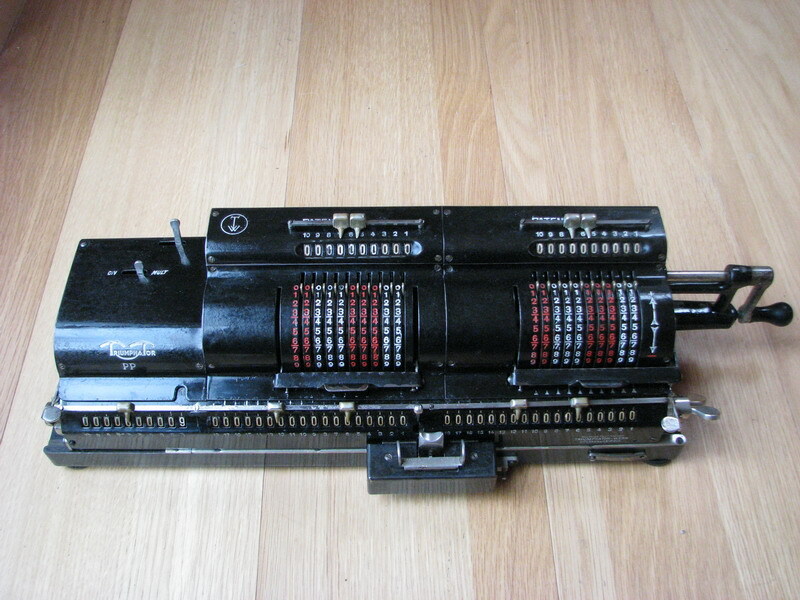 For pointers on operation of the machine, see the double and triple calculator page.